One of the questions I get asked all the time by family and friends is how can they earn money in blogging? They’ve heard about blogging, some have even created a blog, picked a theme and have content written but just are not sure how to monetize it. I figured I’d put together a quick list of the 5 ways that I’ve been able to pull in an income from the very beginning of this journey. 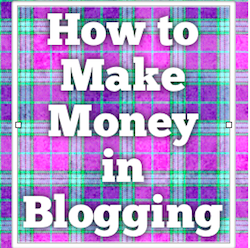 There are many ways you can use your blog to make money but implement the following today and the other ways will come. You ever visit a site and you see an ad for something that you were just looking for? Then you visit another site and there is another ad glaring at you for the very thing you’ve been searching on? That my dear friend is called Google Adsense. When you have a blog/website and you choose to allow Google Adsense to display relevant and engaging ads on your site, you receive money every time someone clicks on that ad. Now don’t go clicking on it yourself or have family members clicking it because you could be banned from Google Adsense and you definitely don’t want that to happen. I LOVE affiliate programs. You are basically selling other people’s or companies stuff and they pay you for doing it. Ever buy a kitchen appliance that you just absolutely fell in love with and told all your friends and family about it. What would have happened if you got paid every time they ran out and purchased that product? You might not be rich but it would be pretty cool if that happened. Well it does happen through affiliate programs. For as long as I’ve been in Internet Marketing I’ve heard the phrase the “money is in the list,” and to be quite honest with you I have to agree. Now before you go and think that Email marketing is dead and that everyone is getting away from it, did you know that according to the Direct Marketing Association that Email Marketing has an ROI of around 4,300%? Say what??? That doesn’t look like Email Marketing is dead to me. So why is that number so high? It’s pretty simple really, if you give your readers value then they will give you their time.Think about it for a second, the readers of your blog literally sign up for your email letting you know that they trust you enough and want your information sent directly to their private email address. When you build that sort of trust there is nothing holding you back. Becoming an Amazon Associate is easy to sign up for and best of all is Free. When you become an associate you are able to showcase products on your website that point back to Amazon and you receive a commission from that. Depending on how many items you sell will determine how much of a percentage you make off the items. Below is Amazon’s pay structure. If you have your own product then by all means use your blog to showcase that product. Instead of sending visitors to other sites to purchase items you have a unique opportunity to only sell your products. Or if you are a local business and you have visitors coming to your site through your blog post then you can always point them to the services that you offer. Hey there Michael. I’ve added you to the mailing list. Out of curiosity what sort of emails would you like to receive from me? Just want to make sure I’m giving you valuable information and not just another email in your inbox.